I am an atmospheric scientist with a personal interest in cloud microphysical processes. 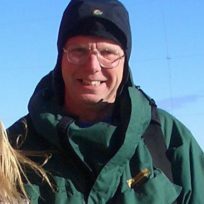 I lead the Climate Processes group at BAS whose role is to investigate the processes that drive the Antarctic Climate system including clouds, surface fluxes, sea ice and links to the upper atmosphere. I originally joined BAS in 1977 and wintered in Antarctica between 1978 and 1980. I then spent a period as a weather forecaster in the North Sea before completing a PhD in upper atmosphere winds at University of Sheffield. I returned to BAS in 1988. My particular research interest is in Antarctic clouds and the processes involved in their formation. I use a variety of methods to investigate clouds and the aerosols needed for their formation including aircraft and ground based measurements. I lead the Climate Processes group. As such I am responsible for the meteorological instrument fit to the BAS Twin Otter. I use this aircraft to study energy exchange above sea ice and in the marine boundary layer. Lachlan-Cope, Tom. (2007) Clouds. In: Encyclopedia of the Antarctic, New York, Routledge, 265-267. Lachlan-Cope, Tom. (2007) Teleconnections. In: Encyclopedia of the Antarctic, New York, Routledge, 985-986. Lachlan-Cope, T.A.. (1998) The use of high resolution weather satellite imagery for the support of science. In: Proceedings of the Seventh Symposium on Antarctic Logistics and Operations, Cambridge, August 1996, Cambridge, British Antarctic Survey, 157-162. Lachlan-Cope, Thomas A.. (1991) Principal component analysis applied to cloud detection and first guess selection for TOVS retrieval over Antarctica. In: Technical proceedings of the Sixth International TOVS Study Conference, Airlie, Virginia, May 1991, Madison, Wisconsin, Cooperative Institute for Meteorological Studies, 286-292.